On the third floor of Pittsburgh International Airport, non-ticketed visitors can receive a myPITpass by showing their ID and passing through security to airside. The program began on Sept. 5, 2017. "Arch" the robot/bridge creature/transformer-type structure greets visitors on the landside terminal area of Pittsburgh International Airport. The art, created by Glenn Kaino in 2008, is one of many exhibits at PIT that exemplify elements of the city. Every day, around 100 people visit a special check-in booth in a corner of Pittsburgh International Airport. They aren’t there to pick up tickets, and they don’t have any luggage. These people are doing something that hasn’t been possible since before the terrorist attacks of Sept. 11, 2001: they’re going to the airside terminal without plane tickets. Allegheny County Airport Authority CEO Christina Cassotis at Pittsburgh International Airport on Wednesday, May 30, 2018. Cassotis has led the airport since 2015 and was a driving force behind the facility's ongoing renovation. It’s been about nine months since PIT became the first airport in the country to pilot the program. To participate in myPITpass, visitors must show ID and pass through security, just like any ticketed passenger. The facility launched the program in September 2017 after what Allegheny County Airport Authority CEO Christina Cassotis called years of people asking for access. “It seemed like it was something that was really important to this community,” Cassotis said. MyPITpass is only available from 9 a.m. to 5 p.m., ensuring that peak traffic hours at the airport don’t become even busier, Cassotis said. People that take advantage of the program come for a number of reasons, including to dine, shop and greet flyers at their gates. “We see young families out there during school hours. These are preschool kids, and it’s clear that they are going out to look at planes,” Cassotis said. Renovated in the late 1980s and re-opened in 1992, the Moon Township airport was built to accommodate a hub for US Airways; then the airline suffered financial trouble and fled. "Overbuilding” an airport isn’t unique to Pittsburgh, according to AirlineWeekly.com’s Seth Kaplan, but the way PIT leadership chose to address the problem makes it stand out. “It’s an airport that can’t take business for granted, and they know that,” Kaplan said. People probably won't spend a lot of time shopping and dining, he said, but opening the airport to the public is an interesting idea. “If people know, 'Hey, it’s going to be a friendlier place to drop off or pick up their relative. They can spend some extra time there,' That is a nice thing,” he said. With about 8 million passengers each year, PIT’s size also helps make it possible for the program to succeed. Any larger, Kaplan said, and security would likely have their hands full processing travelers. The myPITpass is one of several ongoing projects airport officials hope will make the facility more inviting. For travelers who don’t fly often, Cassotis said, the airside program is an opportunity to do a “test run” at the airport. Visitors can find their gate and walk through their schedule ahead of their actual takeoff time. New art exhibits and local restaurant openings are also giving PIT the distinct Pittsburgh feel Cassotis and her team want to establish. The Fred Rogers, Andy Warhol and children’s play area have all been upgraded with new technology to, as Cassotis said, “feel fresh and represent who and what Pittsburgh and the region are today.” Carnegie Mellon University, the Frick and the Carnegie museums also have an artistic presence on different concourses. “There’s so much more that I think we can do around this sense of place,” Cassotis said. Over the next few years, the airport will undergo a major transformation, referred to as the Master Plan Update. It includes a relocation of the Landside Terminal, a new terminal processor and new parking lots. 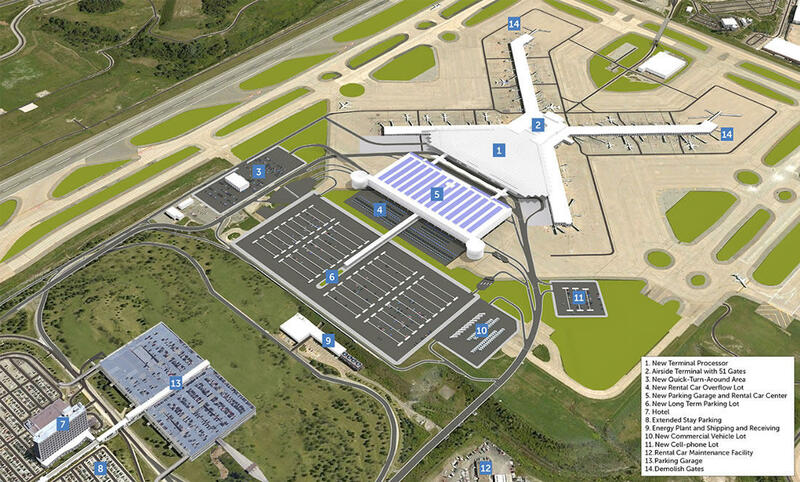 A computer-generated design of the PIT terminal modernization program, which includes a new airside terminal, parking lots and energy plant. *This article was updated on June 12, 2018 at 10:50 a.m. to reflect in the photo caption that the myPITpass program began in 2017. The deep, ominous rumble of a Boeing B-29 Superfortress heavy bomber's four engines, a sound that echoed throughout the Pacific Ocean during World War II, was heard again on Monday in the skies above Richland Township. "Fifi," one of only two B-29 Superfortresses in the world that still fly, touched down on Monday afternoon at John Murtha Johnstown-Cambria County Airport, as did two other World War II-era aircraft belonging to the Commemorative Air Force, a Texas-based nonprofit dedicated to preserving and showing historical aircraft at airshows. An interview with Diane Powell. Around six months ago, during a West End community meeting hosted by Black Women for Positive Change, Pittsburgh chapter president Diane Powell heard a frustration she knew how to tackle. Emerson Botts is full energy in the morning. Skipping down the sidewalk on the three-block walk to her school, she tells her mom how sad she is that the school year is ending. Director Morgan Neville discusses his new film "Won't You Be My Neighbor?" Morgan Neville never met Fred Rogers. Growing up, he had the same relationship with Mister Rogers’ Neighborhood as did many people his age: Neville, now 50, watched the show, then more or less forgot about it.